Attention whip-smart writers! Billy is looking for freelancers with expertise in a variety of fields. What’s Billy, you ask? We are the digital magazine and travel app of Toronto’s Billy Bishop Airport. We’re kind of like an in-flight magazine, for an airport, in an app (and, yes, online). Billy Bishop Toronto City Airport is Toronto’s inner-city airport, located on an island and connected by the mainland by tunnel. People who travel through the airport simply love it. Now we’re looking to entice people to love Billy. Billy is geared toward an audience of savvy travelers, a high proportion of whom work in business, the professions and other information-based and creative jobs. Our content ranges from business and technology coverage to food & drink and lifestyle stories, with a focus on the cities served by the airport, including (but not limited to): Ottawa, Montreal, Quebec City, Halifax, Thunder Bay, New York, Chicago, Boston, Washington, Pittsburgh, and more. We are looking for writers with an intimate knowledge of what makes these cities amazing. You know where to eat and drink, where to find the hidden gems and the hottest new spots, have a sense of the people, artists and companies that make your city thrive. You’re generally on top of what’s going on. We are also on the hunt for people who can spin smart, intriguing and unique stories about business, tech and innovation, the arts, lifestyle and travel (we’re not just interested in the cities we cover, but also stories about how to travel smart). Billy writers must have a sense of personality while also being able to write to the Billy voice (more like that brisk, lively knowing friend with a hot tip versus first-person blogging styles), must come brimming with story ideas (we suggest having a good look at our site first), and must have more than a passing knowledge of the concept of meeting deadlines. Exhibit Submissions: The Port maintains an open call for exhibit proposals. Please review the exhibit requirements below before applying. Work chosen for exhibit at PDX must be conceived with sensitive regard to the community and must be appropriate for a public setting. Exhibited work must be of an excellent aesthetic standard, demonstrating mastery of materials and technique. Artists chosen for exhibit are representatives of the regional fine art community, producing innovative concepts for public consideration. Exhibits must be physically suited to the space, allowing uninterrupted traffic flow in the terminal, hallways and other pedestrian areas. Exhibitors must be willing to sign the exhibitor’s agreement, hold harmless agreements, and provide insurance as required. Exhibits featuring work specifically designed and fabricated for installation at PDX are provided an honorarium not to exceed $1500. Rotating Exhibits: Within the PDX terminal, there are three rotating exhibit spaces that change every six-months. Regional artists are invited to submit digital images of their existing work for consideration. Acceptance or review of materials does not guarantee an offer to exhibit. Site-specific Installations: PDX features four site-specific installation spaces that change annually. Regional artists are invited to submit digital images of previous work to be considered for commissions. Acceptance or review of materials does not guarantee an offer to exhibit. Selected artists are required to create site-specific proposals for final approval. Artists selected to exhibit are paid a $1500 honorarium for design and fabrication of artwork. International Exhibit: PDX has one pre-security exhibit space that features the work of international artists, or regional artists working on an international themes. Artists are invited to submit digital images of their existing work for consideration. Acceptance or review of materials does not guarantee an offer to exhibit. Applications: To apply, send three digital images of your work or a link to your website by emailing Greta Blalock, the Port Art Administrator, at greta.blalock@portofportland.com In your email, please specify the type of exhibit space for which you are applying. Established in 1988, the Arts at the Airport Foundation is an ever-growing, ever-changing showcase of Tennessee’s cultural heritage and creative talents. 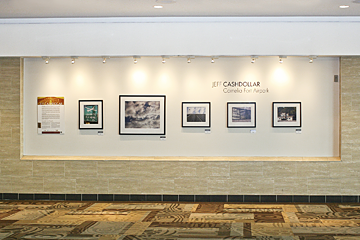 The terminal and surrounding facilities at Nashville International Airport were designed to incorporate rotating public art exhibitions and permanent acquisitions for the enjoyment and enrichment of its passengers, visitors and employees. The Flying Solo Exhibition Series is supported by the Metropolitan Nashville Airport Authority (MNAA) and is funded under an agreement with the Tennessee Arts Commission (TAC). Honoraria awarded to selected artists for a Flying Solo exhibition range from $500 to $1,000. Part of the Arts at the Airport program, the Flying Solo Exhibition Series was developed in 1996. The series provides a highly visible venue for Tennessee artists, and acts as an advocate for the public value of art in the region. You must choose one category per application submission. You can submit more than one application if your work fits more than one category. Artists working in large-scale 2-dimensional media (or possessing and demonstrating the ability to do so) or low profile 3-dimensional media, i.e. suspended installations and sculpture. This category requires a site-specific proposal explanation or sketch. Artists working in 2-dimensional media including photography (artwork must be framed or able to be protected by plexi – profile less than 4” including frame and molding). Community groups, non-profit organizations, universities and other groups with a Tennessee connection are encouraged to submit art exhibit proposals in this category. NOTE ABOUT ELIGIBILITY: This opportunity is only open to Tennessee residents or artists who can demonstrate a strong connection to Tennessee either through prior residency or your work. Deadline for proposals is Thursday, March 31, 2016 at Midnight, MMST / 1:00 a.m. CST.